It is perhaps time to reconsider the problem of machine-wrecking in the early industrial history of Britain and other countries. About this form of early working-class struggle misconceptions are still widely held, even by specialist historians. Thus, an excellent work, published in 1950, can still describe Luddism simply as a 'pointless, frenzied, industrial Jacquerie, and an eminent authority, who has contributed more than most to our knowledge of it, passes over the endemic rioting of the eighteenth century with the suggestion that it was the overflow of excitement and high spirits. Such misconceptions are, I think, due to the persistence of views about the introduction of machinery elaborated in the early nineteenth century, and of views about labour and trade union history formulated in the late nineteenth century, chiefly by the Webbs and their Fabian followers. Perhaps we should distinguish views and assumptions. In much of the discussion of machine-breaking one can still detect the assumption of nineteenth-century middle-class economic apologists, that the workers must be taught not to run their heads against economic truth, however unpalatable; of Fabians and Liberals, that strong-arm methods in labour action are less effective than peaceful negotiation; of both, that the early labour movement did not know what it was doing, but merely reacted, blindly and gropingly, to the pressure of misery, as animals in the laboratory react to electric currents. The conscious views of most students may be summed up as follows: the triumph of mechanization was inevitable. We can understand and sympathize with the long rearguard action which all but a minority of favoured workers fought against the new system; but we must accept its pointlessness and its inevitable defeat. The tacit assumptions are wholly debatable. In the conscious views there is obviously a good deal of truth. Both, however, obscure a good deal of history. Thus they make impossible any real study of the methods of working-class struggle in the pre-industrial period. Yet a very cursory glance at the labour movement of the eighteenth and early nineteenth century shows how dangerous it is to project the picture of desperate revolt and retreat, so familiar from 1815 to 1848, too far into the past. Within their limits - and they were intellectually and organizationally very narrow - the movements of the long economic boom which ended with the Napoleonic Wars were neither negligible nor wholly unsuccessful. Much of this success has been obscured by subsequent defeats: the strong organization of the West of England woollen industry lapsed completely, not to revive until the rise of general unions during the First World War; the craft societies of Belgian woollen workers, strong enough to win virtual collective agreements in the 1760s, lapsed after 1790 and until the early 1900s trade unionism was for practical purposes dead. Yet there is really no excuse for overlooking the power of these early movements, at any rate in Britain; and unless we realize that the basis of power lay in machine-wrecking, rioting and the destruction of property in general (or, in modern terms, sabotage and direct action), we shall not make sense of them. To most non-specialists, the terms 'machine-wrecker' and Luddite are interchangeable. This is only natural, for the outbreaks of 1811-13, and of some years after Waterloo in this period, attracted more public attention than any others, and were believed to require more military force for their suppression. The 12,000 troops deployed against the Luddites greatly exceeded in size the army which Wellington took into the Peninsula in 1808. Yet one's natural preoccupation with the Luddites tends to confuse the discussion of machine-breaking in general, which begins as a serious phenomenon (if it can be properly said to have a beginning) some time in the seventeenth century and continues until roughly 1830. Indeed, the series of farm-labourers' revolts which the Hammonds baptized the 'last labourers' rising' in 1830 was essentially a major offensive against farm-machinery, though it incidentally destroyed a fair amount of manufacturing equipment too. In the first place, Luddism, treated as a single phenomenon for administrative purposes, covered several distinct types of machine-breaking, which for the most part existed independently of each other, but before and after. In the second place, the rapid defeat of Luddism led to a widespread belief that machine-breaking never succeeded. Let us consider the first point. There are at least two types of machine-breaking, quite apart from the wrecking incidental to ordinary riots against high prices or other causes of discontent - for instance, some of the destruction in Lancashire in 1811 and Wiltshire in 1826. The first sort implies no special hostility to machines as such, but is, under certain conditions, a normal means of putting pressure on employers or putters-out. 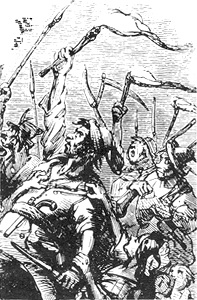 As has been justly noted, the Nottinghamshire, Leicestershire and Derbyshire Luddites were using attacks upon machinery, whether new or old, as a means of coercing their employers into granting them concessions with regard to wages and other matters. This sort of wrecking was a traditional and established part of industrial conflict in the period of the domestic and manufacturing system, and the early stages of factory and mine. It was directed not only against machines, but also against raw material. finished goods and even the private property of employers, depending on what sort of damage these were most sensitive to. Thus in three months of agitation in 1802 the Wiltshire shearmen burned hay-ricks, barns and kennels of unpopular clothiers, cut down their trees and destroyed loads of cloth, as well as attacking and destroying their mills. The prevalence of this collective bargaining by riot' is well attested. Thus - to take merely the West of England textile trades - clothiers complained to Parliament in 1718 and 1724 that weavers 'threatened to pull down their houses and burn their work unless they would agree with their terms'. 8 The disputes of 172 6-7 were fought, in Somerset, Wiltshire and Gloucestershire as well as in Devon, by weavers 'breaking into the houses [of masters and blacklegs], spoiling of wool, and cutting and destroying the pieces in the looms and the utensils of the trade'. They ended in something like a collective contract. The great textile workers' riot at Melksham in 1738 began with workers 'cut[ting] all the chains in the looms belonging to Mr Coulthurst ... on account of his lowering of the Prices'; and three years later anxious employers in the same area were writing to London for protection against the men's demands that no outsiders should be employed, on pain of destroying wool. And so on, throughout the century. Again, where coalminers had reached the point of aiming their demands against employers of labour, they used the technique of wrecking. (For the most part, of course, miners' riots were still directed against high food prices, and the profiteers believed to be responsible for them.) Thus in the Northumberland coalfield the burning of pit-head machinery was part of the great riots of the 1740s, which won the men a sizeable wage-rise. Again, machines were smashed, and coal set on fire in the riots of 1765, which won the miners the freedom to choose their employers at the end of the annual contract. Acts of Parliament against the burning of pits were passed at intervals through the later part of the century. As late as 1831 the strikers at Bedlington (Durham) wrecked winding¬-gear. The history of the frame-breaking in the East Midlands hosiery trade is too well known to need retelling. Certainly the wrecking of machines was the most important weapon used in the famous riots of 1778 (the ancestors of Luddism), which were essentially part of a movement to resist wage-reductions. In none of these cases - and others might be mentioned - was there any question of hostility to machines as such. Wrecking was simply a technique of trade unionism in the period before, and during the early phases of, the industrial revolution. (The fact that organized unions hardly as yet existed in the trades concerned does not greatly affect the argument. Nor does the fact that, with the coming of the industrial revolution, wrecking acquired new functions.) It was more useful when intermittent pressure had to be put on masters than when constant pressure had to be maintained: when wages and conditions changed suddenly, as among textile workers, or when annual contracts came up for simultaneous renewal, as among miners and seamen, rather than where, say, entry into the market had to be steadily restricted. It might be used by all sorts of people, from independent small producers, through the intermediate forms so typical of the domestic system of production, to more or less fully fledged wage-workers. Yet it was, in the main, concerned with disputes which arose from the typical social relationship of capitalist production, that between employing entrepreneurs and men who depended, directly or indirectly, on the sale of their labour-power to them, though this relationship existed as yet in primitive forms, and was entangled with the relationships of small independent production. It is worth noting that riot and wrecking of this type seem more frequent in eighteenth-century Britain, with its 'bourgeois' Revolution behind it, than in eighteenth-century France. Certainly the move¬ments of British weavers and miners are very different from the superficially trade-union-like activities of journeymen's associations in many more old-fashioned continental areas. The value of this technique was obvious, as a means both of putting pressure on employers and of ensuring the essential solidarity of the workers. The first point is admirably put in a letter from the town clerk of Nottingham in 1814. The framework knitters, he reported, were now striking against the firm of J. and George Ray. Since this firm employed mainly men who owned their own looms, they were vulnerable to a simple withdrawal of work. Most of the firms, however, rented out the looms to knitters 'and through them acquire entire control of their workmen. Perhaps the most effectual manner in which the combination could coerce them was their former manner of carrying on war by destroying their frames.' In a domestic system of industry, where small groups of men, or single men, work scattered in numerous villages and cottages, it is, in any case, not easy to conceive of any other method which could guarantee an effective stoppage. Moreover, against comparatively small local employers, destruction of property - or the constant threat of destruction ¬would be pretty effective. Where, as in the cloth industry, both the raw material and the finished article were expensive, the destruction of wool or cloth might well be preferable to that of looms. But in semi-rural industries even the burning of the employer's ricks, barns and houses might seriously affect his profit-and-loss account. But the technique had another advantage. The habit of solidarity, which is the foundation of effective trade unionism, takes time to learn - even where, as in coalmines, it suggests itself naturally. It takes even longer to become part of the unquestioned ethical code of the working class. The fact that scattered framework knitters in the East Midlands could organize effective strikes against employing firms, for instance, argues a high level of 'trade union morale', higher than could normally be expected at that period of industrialization. Moreover, among badly paid men and women without strike funds, the danger of blacklegging is always acute. Machine-wrecking was one of the methods of counteracting these weaknesses. So long as the winding-gear of a Northumbrian pit was broken, or the blast¬-furnace of a Welsh iron-works out, there was at least a temporary guarantee that the plant would not be operated. This was only one method, and not everywhere applicable. But the whole complex of activities which eighteenth- and early-nineteenth-century admin¬istrators called 'Riot' achieved the same purpose. Everyone is familiar with the bands of militants or strikers from one works or locality, touring the whole region, calling out villages, workshops and factories by a mixture of appeals and force (though few workers needed much persuasion in the early stages of the fight). Even much later mass demonstrations and meetings were an essential part of a labour dispute - not only to overawe the employers, but to keep the men together and in good heart. The periodic riots of the North-eastern seamen, at the time when hiring contracts were fixed, are a good example, strikes of modern dockers another. Clearly the Luddite technique was well adapted to this stage of industrial warfare. If British weavers in the eighteenth century (or American lumber-men in the twentieth) were a proverbially riotous body of men, there were sound technical reasons why they should be so. remember', writes Rinaldo Rigola, . that in those pre-socialist times the working-class was a crowd, not an army. Enlightened, orderly, bureaucratic strikes were impossible [Rigola was an extreme conservative among union leaders]. The workers could only fight by means of demonstrations, shouting, cheering and cat-calling, intimidation and violence. Luddism and sabotage, even though not elevated into doctrines, had nevertheless to form part of the methods of struggle. We must now turn to the second sort of wrecking, which is generally regarded as the expression of working-class hostility to the new machines of the industrial revolution, especially labour-saving ones. There can, of course, be no doubt of the great feeling of opposition to new machines - a well-founded sentiment, in the opinion of no less an authority than the great Ricardo. Yet three observations ought to be made. First, this hostility was neither so indiscriminate nor so specific as has often been assumed. Second, with local or sectional exceptions, it was surprisingly weak in practice. Lastly, it was by no means confined to workers, but was shared by the great mass of public opinion, including many manufacturers. (i) The first point will be clear if we consider the problem as it faced the worker himself. He was concerned, not with technical progress in the abstract, but with the practical twin problems of preventing unemployment and maintaining the customary standard of life, which included non-monetary factors such as freedom and dignity, as well as wages. It was thus not to the machine as such that he objected, but to any threat to these - above all to the whole change in the social relations of production which threatened him. Whether this threat came from the machine or from elsewhere depended on circumstances. The Spitalfields weavers rioted against machines by which 'one man can do as much ... as near twenty without them' in 1675, against wearers of printed calicoes in 1719, against immigrants working below the rate in 1736; and they wrecked looms against rate-cutting in the 1760s: but the strategic objective of these movements was the same. Around 1800 the western weavers and shearmen were simultaneously in action; the former organized against the flooding of the labour market by extra workers, the latter against machines. Yet their object, the control of the labour market, was the same. Conversely, where the change did not disadvantage the workers absolutely, we find no special hostility to machines. Among printers, the adoption of power-presses after 1815 seems to have caused little trouble. It was the later revolution in typesetting which, since it threatened wholesale down¬grading, provoked a fight. Between the early eighteenth and the mid-nineteenth century mechanization and new devices greatly increased the productivity of the coalminer; for instance, the intro¬duction of shot-firing. However, as they left the position of the hewer untouched, we hear of no important movement to resist technical change, though pitmen were proverbially ultra-conservative and riotous. Restriction of output operated by workers under private enterprise is a different matter altogether. It can and does occur in wholly unmechanized industries - for instance, the building trade; nor does it depend on overt movements, organizations or outbreaks. In some cases, indeed, the resistance to the machine was quite consciously resistance to the machine in the hands of the capitalist. The Lancashire machine-wreckers of 1778-80 distinguished clearly between spinning-jennies of twenty-four spindles or less, which they spared, and larger ones, suitable only for use in factories, which they destroyed. No doubt in Britain, which was more familiar with social relations of production which anticipated those of industrial capitalism, this kind of behaviour is less unexpected than elsewhere. Nor should we read too much into it. The men of 1760 were still a good way from understanding the nature of the economic system they were about to face. Nevertheless, it is clear that theirs was not a simple fight against technical progress as such. Nor is there, for the most part, any fundamental difference in the attitude of workers towards machines, taken as an isolated problem, in the earlier and later phases of industrialism. It is true that in most industries the object of preventing the introduction of undesirable machines has given way, with the coming of full mechanization, to the plan to 'capture' them for workers enjoying trade union standards and conditions, while taking all practicable steps to minimize tech¬nological unemployment. This policy seems to have been adopted patchily after the 1840s and during the Great Depression, more generally after the middle 1890s. Nevertheless, there are plenty of Kamples of the straightforward opposition to machines which threa¬ten to create unemployment or to downgrade labour even today. In the normal working of a private-enterprise economy the reasons which led workers to distrust new machines in the 1810s remain persuasive in the 1960s. (ii) The argument so far may help to explain why, after all, the resistance to machines was so small. The fact is not widely recognized, for the mythology of the pioneer age of industrialism, which men like Baines and Samuel Smiles reflected, has magnified the riots which actually occurred. The men of Manchester liked to think of themselves at only as monuments of enterprise and economic wisdom, but also - a more difficult task - as heroes. Wadsworth and Mann have reduced the riots of eighteenth-century Lancashire to more modest proportions. In fact we have record of only a few really widespread wrecking movements such as that of the farm-labourers, which probably destroyed most threshing-machines in the areas affected, the specialized campaigns of the small body of shearmen in Britain and elsewhere, and perhaps the riots against power-looms in 1826. The Lancashire wreckings of 1778-80 and 1811 were confined to limited areas and limited numbers of mills. (The great East Midland movements of 1811-12 were not, as we have seen, directed against new machinery at all.) This is not only due to the fact that some mechanization was regarded as harmless. As has been pointed out, most machines tended to be introduced in times of rising prosperity, when employment was improving and opposition, not fully mobilized, could be temporarily dissipated. By the time distress recurred, the strategic moment for opposing the new devices was past. New workers serving them had already been recruited, the old hand-operatives stood outside, capable only of random destruction of their competitor, no longer of imposing themselves on the machine. (Unless, of course, they were lucky enough to possess a specialized market which wasn’t affected by machine-production, as hand-bootmakers and tailors did in the 1870s and 1880s.) One reason why the wrecking by the learmen was so much more persistent and serious than that by others was that these highly skilled and organized key-men retained much control over the labour market, even after partial mech¬anization. Nor is this surprising. The fully developed capitalist entrepreneurs formed a small minority, even among those whose position was technically that of profit-makers. The small shopkeeper or local master did not want an economy of limitless expansion, accumulation and technical revolution, the savage jungle pursuit which doomed the weak to bankruptcy and wage-earning status. His ideal was the secular dream of all 'little men', which has found periodic expression in Leveller, Jeffersonian or Jacobin radicalism, a small-scale society of modest property-owners and comfortably-off wage-earners, without great distinctions of wealth or power; though doubtless, in its quiet way, getting wealthier and more comfortable all the time. It was an unrealizable ideal, never more so than in the most rapidly evolving of societies. Let us remember, however, that those to whom it appealed in early-nineteenth-century Europe made up the majority of the population, and outside such industries as cotton, of the employing class. But even the genuine capitalist entrepreneur could be in two minds about machines. The belief that he must inevitably favour technical progress as a matter of self-interest has no foundation, even if the experience of French capitalism and of later British capitalism were not available. Quite apart from the possibility of making more money without machines than with them (in sheltered markets and so on), only rarely were new machines immediate and obvious paying propositions. There is, in the history of any technical device, a 'threshold of profit' which is crossed rather late - the larger the capital that has to be sunk in a machine, the later. Hence, perhaps, the proverbial lack of business success of inventors, who sink their own and other people's money in their projects while they are still inevitably imperfect and by no means clearly superior to their non-mechanized rivals. Of course, the free-enterprise economy could overcome these obstacles. What has been described as the 'vast secular boom' of 1775-1875 created situations, here and there, which provided entre¬preneurs in some industries - for instance, cotton - with the impetus to leap across the 'threshold'. The very mechanism of capital accumulation in a society undergoing revolution provided others. So long as competition operated, the technical advances of the pioneer section were spread over quite a wide field. Yet we must not forget that the pioneers were minorities. Most capitalists took the new machine in the first instance not as an offensive weapon, to win bigger profits, but as a defensive one, to protect themselves against the bankruptcy which threatened the laggard competitor. We are not surprised to find E. C. Tufnell in 1834 accusing 'many of the masters in the cotton trade ... of the disgraceful behaviour of instigating workmen to turn out against those manufacturers who were the first to enlarge their mules' . Petty producer and run-of-the-mill entrepreneur were in an ambiguous position, but without the inde¬pendent power to change it. They might dislike the need for new machines, either because they disrupted their way of life, or because, on any rational accounting, they were not really good business at the moment. In any case they saw them as strengthening the position of the large modernized entrepreneur, the main rival. Working-class revolts against machines gave such men their chance; often they took it. One may reasonably agree with the student of French machine-wrecking who observes that 'sometimes the detailed study of a local incident reveals the Luddite movement less as an agitation of workmen, than as an aspect of competition between the backward and the progressive shop-owner or manufacturer'. If the innovating entrepreneur had the bulk of public opinion against him, how did he succeed in imposing himself? By means of the state. It has been well remarked that in Britain the Revolution of 1640-60 marks a turning-point in the state's attitude towards machinery. After 1660 the traditional hostility to devices which take the bread out of the mouths of honest men gave way to the encouragement of profit-making enterprise, at whatever social cost. 51 This is one of the facts which justifies us in regarding the seventeenth¬ century Revolution as the real political beginning of modern British capitalism. Throughout the subsequent period the central state appar¬atus tended to be, if not ahead of public opinion on economic matters, then at least more willing to consider the claims of the fully capitalist entrepreneur - except, of course, where these clashed with older and bigger vested interests. The Squire Westerns in some counties might still toast the shadow of a vanished feudal hierarchy in an unchanging society: there was no significant trace of feudal policy in the Whig governments, at any rate after 1688. London sympathy was to prove of inestimable value to the new industrialists when, in the last third of the century, their meteoric rise began. On issues of agrarian, commercial or financial policy Lancashire might be in conflict with London, but not on the fundamental supremacy of the profit-making employer. It was the unreformed Parliament in its most ferociously conservative period which introduced full laissez-faire into the relations between employer and worker. Classical free-enterprise economics dominated the debates. Nor did London hesitate to rap its more old-¬fashioned and sentimental local representatives over the knuckles if they failed 'to maintain and uphold the rights of property of every description, against violence and aggression'. Yet until the latter part of the eighteenth century the support of the state for the innovating entrepreneur was not unqualified. The political system of Britain from 1660 to 1832 was designed to serve manufacturers only insofar as they bought their way into the ring of vested interests of an older type - commercially minded landlords, merchants, financiers, nabobs and so on. At best they could only hope for a share of the pork barrel proportionate to their pressure, and in the early eighteenth century the 'modern' manufacturers were as yet only occasional groups of provincials. Hence, at times, a certain neutrality of the state in labour matters, at any rate until after the middle of the eighteenth century. Western clothiers complained bitterly that the majority of local JPs was biased against them. The attitude of the national government in the weavers' riots of 1726-7 contrasts strikingly with that of the Home Office from the 1790s on. London regretted that the local clothiers needlessly antagonized the men by arresting rioters; pooh-poohed suggestions that these were seditious; suggested that both parties get together amicably, so that a proper petition might be framed and Parliament could take action. When this was done, Parliament sanctioned a collective agreement which gave the men very much what they wanted, at the cost of a perfunctory 'apology for past riots'. Again, the frequency of ad hoc legislation in the eighteenth century tends to show that no sys¬tematic, consistent and general attempt was made to enforce it. As the century progressed, the voice of the manufacturer increasingly became the voice of government in these matters; but earlier it was still possible for the men occasionally to fight sections of the masters on more or less fair terms. We now come to the last and most complex problem: how effective was machine-breaking? It is, I think, fair to claim that 'collective bargaining by riot was at least as effective as any other means of bringing trade union pressure, and probably more effective than any other means available before the era of national trade unions to such groups as weavers, seamen and coalminers. That is not to claim much. Men who did not enjoy the natural protection of small numbers and scarce apprenticed skills, which might be safeguarded by restricted entry to the market and strong hiring monopolies, were in any case bound normally to be on the defensive. Their success therefore should be measured by their ability to keep conditions stable - for example, stable wage-rates - against the perpetual and well-advertised desire of masters to reduce them to starvation level. This required an unremitting and effective fight. It may be argued that stability on paper was constantly undermined by the slow inflation of the eight¬eenth century, which steadily rigged the game against wage-earners; but it would be asking too much of eighteenth-century activities to cope with that. Within their limits, one can hardly deny that Spi-talfields silk-weavers benefited from their riots. The disputes of keelmen, sailors and miners in the North-east, of which we have record, ended, as often as not, with victory or acceptable compromise. Moreover, whatever happened in individual engagements, riot and machine-wrecking provided the workers with valuable reserves at all times. The eighteenth-century master was constantly aware that an intolerable demand would produce, not a temporary loss of profits, but the destruction of capital equipment. In 1829 a leading colliery manager was asked by the Lords' Committee whether a reduction of wages in the Tyne and Wearside coalmines could 'be effected without danger to the tranquility of the district, or risking the destruction of all the mines, with all the machinery, and the valuable stock vested in them'. He thought not. Inevitably, the employer faced with such hazards paused before he provoked them, for fear that 'his property and perhaps his life [might] be endangered thereby'. 'Far more masters than one might expect', Sir John Clapham noted with unjustified surprise, supported the retention of the Spitalfields Silkweavers' Acts, for under them, they argued 'the district lived in a state of quietude and repose'. Could riot and machine-breaking, however, hold up the advance of technical progress? Patently it could not hold up the triumph of industrial capitalism as a whole. On a smaller scale, however, it was by no means the hopelessly ineffective weapon that it has been made out to be. Thus, fear of the Norwich weavers is supposed to have prevented the introduction of machines there. The Luddism of the Wiltshire shearmen in 1802 certainly postponed the spread of mechanization; a petition of 1816 notes that 'in time of War there was no giggs nor Frames at Trowbridge but sad to relate it is now Increasing Every Day'. Paradoxically enough, the wrecking by the helpless farm-labourers in 1830 seems to have been the most effective of all. Though the wage-concessions were soon lost, the threshing machines did not return on anything like the old scale. How much of such successes was due to the men, how much to the latent or passive Luddism of the employers themselves, we cannot, however, determine. Nevertheless, whatever the truth of the matter, the initiat¬ive came from the men, and to that extent they can claim an important share in any such successes.